Here at OBEX, we talk a lot about the pros and cons of cubicles vs. open workstations. But these two options do have one thing in common. There are many days when your employees will wish they were elsewhere. 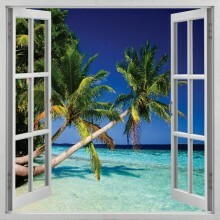 The nice thing about cubicle panels is that they make it easier to “get away” and imagine being on a beautiful tropical beach. You can create whatever view you prefer rather than having to stare at coworkers all day. Here are 3 ways to add a window into the world where employees would like to be if they weren’t stuck in a cube. This manufacturer provides peel and stick decals that you can install directly on the cubicle panel. Employees could select mountains, forests, beaches, hayfields, and more. Has a worker relocated to your regional office from Manhattan?They can still enjoy the New York skyline with a cubicle window. These wallpapers supposedly stick to most surfaces – even fabric-covered acoustic panels. But the Dream Cubicle team sends little pins in the package too just in case these giant stickers need to be tacked down. Sizes for these windows go up to 2×3 feet for a fully immersive experience. 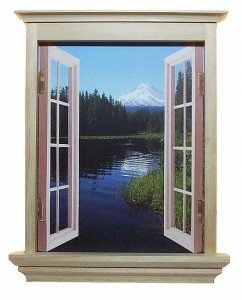 If you want a more true-to-life tactile experience, this option’s got you covered with its real wooden window frame. Employees also get versatility built in since each frame comes with four different “views” printed on heavy duty cardstock. They can switch out the view every day if that’s what it takes to stave off ennui. The main drawback is the size. 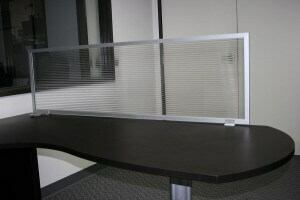 With an opening less than 12×14 in this tiny window, workers may feel like their cubicle is even smaller than before. You know we have a solution for this too – and it’s actually available for either desk mounted panels or panel extenders. We can custom print panels to transport your employees to anywhere they’d like to go. They can gaze at lovely green grass, a pathway strewn with autumn leaves, or the crystal blue depths of a tropical ocean. Unlike wall stickers or cardstock, these panels can easily last for decades. 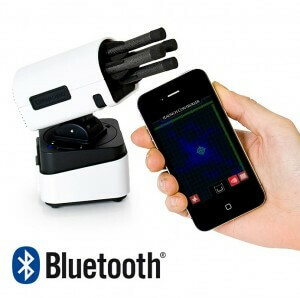 You can install them on one side or all 3 sides of a workstation if you want to create a complete environment of calm. 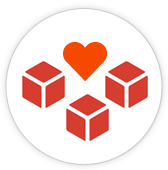 They are also very easy to remove if you decide to switch them out or move them to a different workstation. How many times over the last 15 years have you read an article about the imminent “Death of the cubicle”? It’s a meme that keeps cropping up over and over regardless of how often it is proven wrong. There’s another article up on Mashable right now that says almost 1 out of 5 professionals believe that the cubicle will be “extinct” within the next 5 years. We’re not going to be putting any money on that prediction. In fact, the cubicle has made more comebacks than a reanimated corpse in a zombie movie. No matter how many times someone writes about what the “cubicle-free” offices look like at Google and FaceBook, most white collar workers don’t work at those two companies. In fact, those are the same firms that come up whenever anyone does a slideshow about the coolest offices in the world. Obviously, this distinction doesn’t make them trend setters; it makes them outliers. The fact is that the backlash against the open office with its high noise levels and complete lack of privacy has already begun. Until someone comes up with a completely different alternative, we’re probably looking at most employers finding a balance between open and secluded work areas. 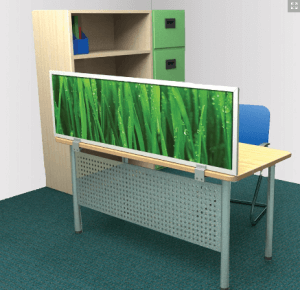 For enclosed workstations, a cubicle with high panels (or a desk with surface mounted privacy panels) is the most sensible and cost effective solution. We came across a funny infographic on Pinterest a couple of weeks ago. In it, “Five O’ Clock Fred” opines the 8 drawbacks of working in a cubicle. In the spirit of a humorous response, we present: the 5 benefits of working in a cubicle that’s equipped with panel extenders. 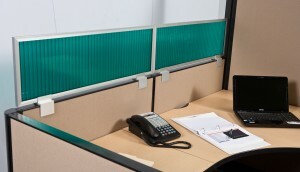 With noise-blocking panel extenders, coworkers are less likely to hear you eating candy. An acoustic panel dampens the sound of rustling candy wrappers, the squeak of the drawer hiding your candy stash, or the crunch of a Kit-Kat bar. If you hate to share your candy, the cubicle is a great place to eat it! Number 8 in the original pinned image says if you talk to yourself in a cubicle, everyone pops their head up over the wall because they assume you are talking to them. Of course, in a cubicle with walls low enough for people to see over, coworkers usually can hear you if you are talking to yourself. That’s yet one more reason to install panel extenders that help block sound. You have the privacy to carry on a conversation with yourself to your heart’s content without being rudely interrupted.